On page 24 one reads the following: “Al-Aqsa mosque, built on the ruins of the Temple of Solomon, was known as the Dome of the Rock because it contained the block of stone from which the prophet Mohammed is believed to have ascended into heaven.” It has always been my understanding that the Al-Aqsa mosque and the Dome of the Rock (Masjid Qubbat As-Sakhrah) were two distinctly different structures (they certainly are today). Leaving aside the history of these mosques (not terribly well documented), it suffices to say that medieval writers certainly describe two separate buildings. The Dome of the Rock is known to them as Templum Domini, and the Al-Aqsa mosque is referred to as Templum Salomonis. Saewulf, for instance, describes the Dome of the Rock (In cuius Templi medietate rupes conspicitur alta et magna et subtus concavata, in qua erant sancta sanctorum: ibi imposuit Salomon archam federis, habens manna et virgam Aaron, quae ibidem floruit et fronduit et amigdalum protulit, et duas tabulas testamenti. ), but adds: “In atrio Templi Domini ad meridiem est Templum Salomonis mirae magnitudinis, ad cuius orientalem plagam est oraculum quoddam, habens cunabulum Christi Iesu et balneum ipsius et lectum beatae matris eius testantibus Assyriis.” Initially I thought that an unfortunate translation error caused the conflation of the two buildings. However, on page 85 the Al-Aqsa mosque is again mentioned as the location of a “sacred rock” in connection with the famous story of ibn Munqidh. And yet, on page 111, Al-Aqsa and the Dome of the Rock are listed as two separate Temple Mount buildings that remained in Muslim hands after Frederick’s treaty with Al-Kamil. The confusion does not end with Ms. Frale, by the way. J. Phillips in his “Holy Warriors: A Modern History of the Crusades”, on page 59, identifies Templum Domini as modern day al-Aqsa Mosque. 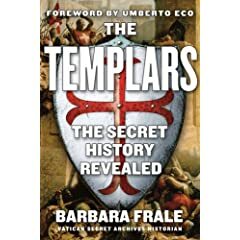 Personally, I have always found it confusing that the Crusaders, certainly aware of the fact that the Foundation Rock was located in the Holy of Holies of the original Temple of Solomon, chose instead to refer to the nearby Al-Aqsa mosque as Templum Salomonis. However, medieval sources are very clear on this account.